CLICK HERE FOR MORE STORIES BY TASHA SURI. 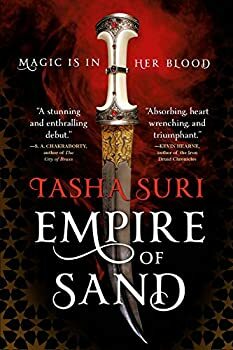 Empire of Sand is one of those rare debut novels that doesn’t read at all like a first effort; Tasha Suri’s prose is strong and assured, her characters are nuanced and multi-layered, and her world-building is lushly detailed. Since Empire of Sand’s publication in November 2018, a sequel has been announced, along with the news of its being optioned for a television series, which is quite impressive for a book that’s only two months old as of this writing.